Wonderful, mysterious, you can exhaust the most sublime words from your vocabulary: Yet the Himalayas will remain beyond them. It is the monarch of the mountains, the measuring pole of the earth. The region is not a mere world, but it contains many worlds. There are no mountain ranges in the world, which have contributed so much to shape the life of a country as the Himalayas to the people of India. It is not only the political life of the people of Hindustan, but the religion, mythology, art, and literature of the Indian that bear the imprint of the great mountain barrier. The majesty of the snow-clad peaks, visible from afar, the inaccessibility of even the much lesser ranges, the mysteries of the gigantic glaciers and the magnificence of the great rivers that emerge from its gorges have combined to give the Himalayas a majesty that no other mountain range can ever claim. Monsoon is the traditional time to go up the Hills. 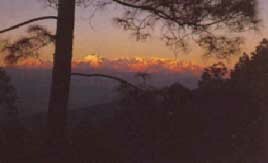 In the lower Himalayas the choice is wide from Shimla right across to Darjeeling. Mount Everest is the highest mountain in the world. Its elevation of 29,035 feet (8,850 meters) was determined using GPS satellite equipment on May 5, 1999. The first seven attempts on Everest, starting with a reconnaissance in 1921 were all unsuccessful. Unsuccessful attempts continued through 1938, then halted during World War II. By the war's end, Tibet had closed its borders, and Nepal, previously inaccessible, had done the opposite. 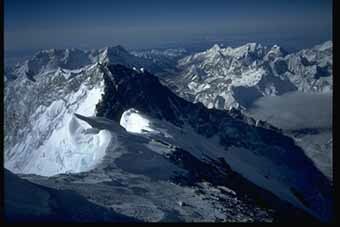 Starting in 1951, expeditions from Nepal grew closer and closer to the summit, via the Khumbu Icefall, the Western Cwm, over the Geneva Spur to the South Col, and up the Southeast Ridge. In 1953 Edmond Hillary and Tenzing Norgay reached the summit. Since the first successful ascent, many other individuals have sought to be the first at various other accomplishments on Everest, including many alternative routes on both the north and south sides. Italy's Reinhold Messner has climbed Everest twice without oxygen, once in four days. He is also the first to solo climb Everest, which he did in 1980. Ten years earlier, Yuichiro Miura of Japan had been the first person to descend the mountain on skis. In 1975, Junko Tabei, also of Japan, was the first woman to climb Everest. The first disabled person to attempt Everest was American Tom Whittaker, who climbed with a prosthetic leg to 24,000 feet in 1989, 28,000 feet in 1995, and finally reached the summit in 1998. The record for most ascents belongs to Sherpa Ang Rita, who has reached the summit ten times. Overall, more than 600 climbers from 20 countries have climbed to the summit by various routes from both north and south. Climbers' ages have ranged from 19 to 60 years. At least 100 people have perished, most commonly by avalanches, falls in crevasses, cold, or the effects of thin air. Climbing on Everest is very strictly regulated by both the Nepalese and Chinese Governments. Permits cost thousands of U.S. dollars and are difficult to obtain, and waiting lists extend for years . Tenzing Norgay and Hillary stood on the top of Mount Everest, hugging each other one fine friday morning.This was the sixth try putting his life at stake for Tenzing. At last they stood on the top of the world. Tenzing dug a hole in the snow and put down some small sacrifice gifts - symbolic things that he had brought with him. He left a few biscuits, some chocolate and a blue-pen. The blue-pen was just a little piece that his youngest daughter Nima gave him when he left home. Tenzing took foru small flages from his pocket, and attached them in a piece of rope, four foot long. He attached the rope on around his ice-axe. Hillary took a few photos whileTenzing let the flags fly On the top of the world there were place for two, perhaps three persons if you removed some iceaccording tot eh first climbers. They stayed just longer than a quarter of an hour on the summit and were grateful that no storm had forced them down.